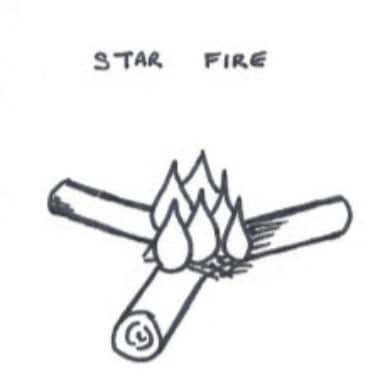 The Indian Star Fire, also known simply as the Indian Fire or Star Fire, is attributed to the North American Indians with frequent references to the wild west. This fire offers a lot of control over the consumption and management of wood and is a good option when this resource is scarce. It has a basic temperature control which is effectively, if you want it hotter, push the branches in. If you want it cooler, pull the branches out. 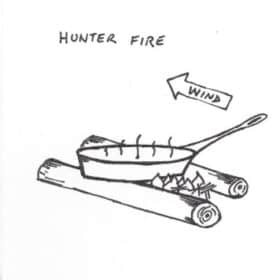 This is great option in survival situations when lighting a fire traditionally can expend a lot of energy or resources. A star fire is good for cooking basic one-pot meals including boiling, grilling, frying and stick cooking. A tripod can be place over the top of it also, when doing this it is often referred to as a gypsy fire. 1/ Assess the location.This fire has relatively few needs, primarily a flat location, away from trees and overhead flammable items, most likely also from trees. As always consider the surroundings for fire hazards, wind direction and similar. 2/ Mark out the base. This fire works best if a small ditch is dug about 6 inches / 15cm wide and 2 inches / 5cm deep at the center of the star. This will give the burning coals somewhere to fall and gather creating a better cooking situation. It also means the sod of earth can be replaced when you leave, leaving a cleaner environment behind. 3/ Lay the fire. Place at least three logs about the thickness of your arm with the points almost touching in the middle over the hole. Three is the typical amount portrayed in many images but versions include 4, one for each point of the compass, or up to 6 as seen in the stereo-type Cowboy and Indian movies). In the middle build a small starter fire with enough fuel to catch the large log tips on fire. 4/ Light the fire. This starter fire should be easily lit with a single match (or equivalent) this will then catch the larger logs on fire. 5/ Maintaining the fire. Once lit the large logs can be pushed in or pulled apart to vary the burn rate. The hot coals will build up in the ditch which can then be used for cooking. 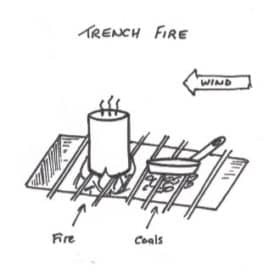 No additional wood should need to be added but at time is may make sense to add sticks to it just prior to cooking or during to create flames for boiling if this can’t be achieved from the logs alone. 6/ Extinguishing the fire. Although this fire is in a small ditch it is still primarily exposed on the surface of the ground making it susceptible to issues from the wind if not extinguished correctly. 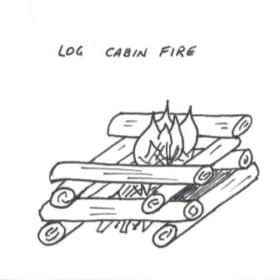 The large feeder logs can be pulled back from the central fire especially starving it of fuel. It should then be extinguished carefully with water. Do not leave until it is fully extinguished and cool to the touch otherwise it can re-ignite. The Log Cabin Fire is one of the most popular methods for starting fires. Its a criss-cross of wood that once burning can be used for flame or coal cooking.